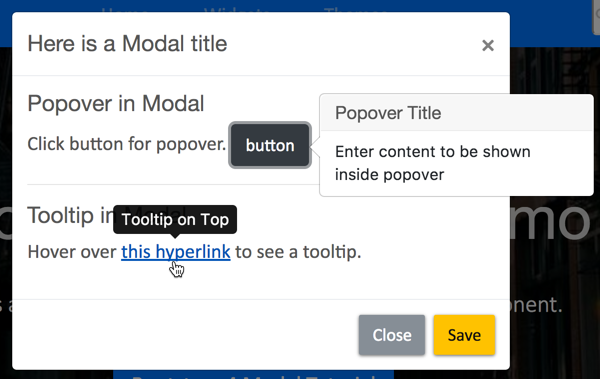 In this tutorial let us create some modal popups to understand the details of the component. The attribute data-toggle=”modal” is used to identify the button as a modal component. Next is the data-target=”#Modal1″ which is an ID should be unique. This same ID needs to be used in the modal component. Below is the code for the modal popup, you should use this code between the body section of the Bootstrap 4 starter template. Here goes the content of the modal. The outer div wrapper should have a “.modal” CSS class. The additional “.fade” class is used for fading the modal box which is optional. The ID should be same as the ID value set for the button component. Ensure to add other attributes like tabindex, role and aria-hidden. The modal content should be added within <div> tags identified with “.modal-dialog” class. 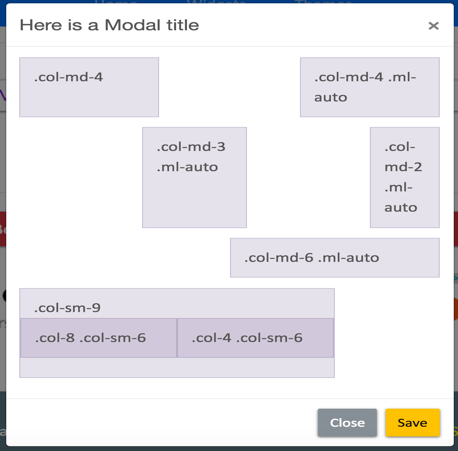 Modal has a panel or card structure having content, header, title, body and footer classes. All parts of the modal should be wrapped inside a <div> with “.modal-content” class. The header section is identified with “.modal-header” class and has two components – title and button. The title component uses “.modal-title” and is used to add a heading to the modal popup. The button components is used for including close icon (X) to close the modal dialog box. The modal body uses the class “.modal-body” and contains the body of the modal which can be any elements like text, button, tooltip or popover. The footer section uses “.modal-footer” and contains two buttons – one for closing and another for saving. The close button will actually close the modal popup. But the save button is a dummy button and you should add your own code to save the documents on the server. The final output will simply look like a button and clicking on it will trigger a popup modal box. You can add any type of content inside the modal body section and also have variations in header and footer sections. When the content length is long, it can be scrolled within the modal without scrolling the outside page. 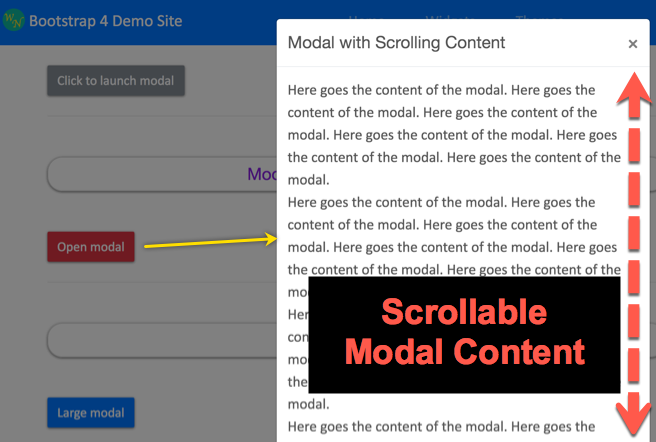 Below is the code for creating scrollable modal popup. Here is the content for modal, enter lengthy content so that you can see the scrolling effect. Sizing here indicates the width of the modal. You can increase or decrease the size by adding “.modal-lg” or “.modal-sm” class to the “.modal-dialog” class. Here goes the content of large modal. Here goes the content of small modal. You can see larger, default and smaller modal sizes as below. The live demo of Bootstrap 4 modals can be seen here. The tooltip and popover will look like below. The tooltip will on top show on hover and the popover will show in left on click. Bootstrap 4 has powerful flexbox grid layout system. You can easily insert content inside the modal using grid layout columns. Below is an example to insert different types of grid columns within a modal. As you can see, the latest Bootstrap 4.0 version allows you to add any type of content inside the modal popup. You can customize the color, borders and look of each item within the modal by additional additional CSS on your own. For example, in the above grid example we have used a custom CSS class “.gridmodal” to add background, border and spacing like below. You can also add the CSS class to the default Bootstrap classes. For example, when you want to add shadow effect to the modal buttons you can just add “btn-md” class like below. The custom CSS for the “btn-md” class is given below which can be added inside the header part of the HTML page within <style>…</style> tags. Or you can add the code in external CSS file (probably your theme’s style.css” and link the CSS in the header. Modals are an easy way to show content in a popup dialog box. This helps a lot to focus on the main content offered on the page. Interested users can click the link or button to invoke the modal windows and read further. This is a JavaScrip modal. Bootstrap enhances this with additional buttons and options.